What amazes me about Laura Frantz isn't just how accurate her historical prowess is, but how she weaves this great story of war and love together. She takes the mood of colonial America, how the views of men like Patrick Henry and George Washington, to act out on its best interest to throw off British law. Frantz does this amazing job of showing the mood of colonial Virginia, especially in Williamsburg toward Loyalist claims in favor of British rule. I find her writing and her style of writing truly an art form. When I say this, I mean it in the utmost sense of respect for Laura Frantz. She has taken the rules of writing and, I feel, broken them all to come up with this writing form that tells a rapturous story of passion. And when i say "passion" here, I don't mean the very intimate kind between lovers. I mean it in the sense of following the heart, and making those decisions based on facts and ideas that are present. If you know anything about American history and how hard it was for some colonial Americans to go against the crown of Britain, the fight was amazing. On one hand you have those who love their British family, but who view this idea of "freedom," "fair exchange, "taxation without representation," and a myriad of other views toward Britain a tough fight to go against their British family and counterpart. The thing of it all is I'm saying here is what I'd also say about the American Civil War, which would happen less than one hundred years later. Family, it's all we have. And sometimes ideas, beliefs, and the pursuit of freedom are all we have. Sometimes you have to face a choice you have to make and stake a side. I know I would have had to face a hard decision in colonial America. I managed to trace both of my parent's families to that time frame. We don't truly know everything there is to know about our own history if we don't even know our own family history and where those sympathies lay. 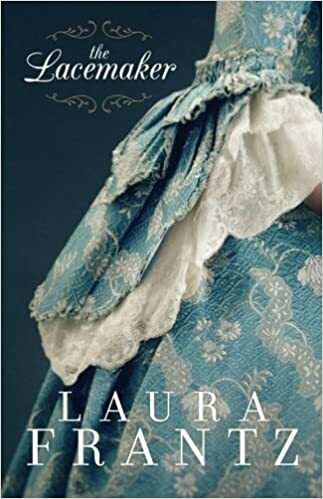 So, overall, I find that I absolutely love and recommend Laura Frantz's The Lacemaker. It's one heck of a story for Elizabeth "Liberty" Lawson as well as for Noble Rynallt. The last thing I will say is this. When I was reading the story, I kept seeing Keira Knightley's face for Liberty Lawson, and Aidan Turner as Noble Rynallt. For me it's kind of a Poldark meets Pride and Prejudice. Great storyline, great characters, and great character development. I received a copy of The Lacemaker by Revell in the hopes of an honest and objective review of it. All thoughts and opinions are mine.